Cents of Style, online at mycentsofstyle.com, is the ultimate place to go for accessories at bargain prices. Courtney Brown and Brennan Lau, founders of Cents of Style, live by 2 motto's: you don't have to spend a lot to look great, and when you look good, you feel good, and then you can do good. Not only does Cents of Style have amazing accessories, such as necklaces, bracelets, earrings, rings, etc, but they also have clothing, shoes, bags, and more. Want to know what to wear with your new shirt or necklace to make a bold outfit? Then check out their website at mycentsofstyle.com and enjoy blogs written for their clothing and accessories for pairing to look your absolute best. Visit RetailSteal.com for all the latest Cents of Style discounts, Cents of Style coupon codes, and Cents of Style promo codes. Use code at Cents of Style and save 50% on Taffeta skirts and heels. Use this promotional code at Cents of Style to purchase ankle booties for just $22.95! Receive free earrings and free shipping on your first order from Cents of Style when you use this promotional code! Save an additional 50% and receive free shipping on clearance purchases from Cents of Style with this coupon code! Use code at Cents of Style and save 50% on one t-shirt. Click here for code. Enjoy 20% savings on any item only at Cents of Style. Click here for code. 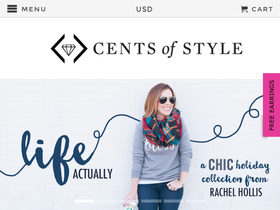 Use this coupon code online at Cents of Style and enjoy a $10 discount on your order of $100+. Shop at Cents of Style and get 10% off sitewide. Also enjoy free shipping with your order. Click here for code. Act now and save up to 75% off sale items from Cents Of Style online. Spend $20 or more at Cents of Style and enjoy a free pair of earrings with your order. Click here for code. Shop at Cents of Style and get select graphic tees starting at just $9.95. Enjoy 10% off your order from GreekCreations.com when you use this coupon code online. For a limited time only, enjoy free shipping on your order of $75+ from King Ice. Check out the clearance section at Kingice.com and save up to 80% off a wide range of bling including earrings, chains, pendants, and more. Spend $50 or more at TogShop.com and get free shipping. Click link to shop. Save up to 70% in The Tog Shop's outlet center. Click link to shop and save. Buy a SmokeStik starter kit starting at $89.95. Click link to save. Save $10 on orders $100+ at Hats.com with code. Click link now to save. Check out the sale section at Hats.com and save 35-60% off your favorite hat styles. Click link to start shopping. Check out the final sale items on LuckyBrand.com and save up to 75%. Click link to save.